Mergansers and Bufflehead at Flat Rock Dam. 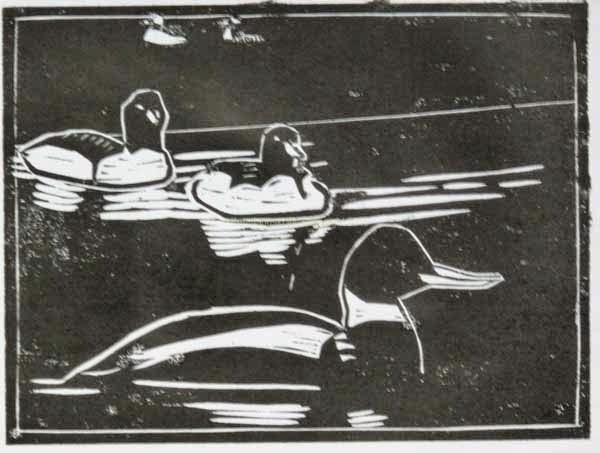 Early Proof of Woodcut by Ken Januski. When we first started birding in Philadelphia many years ago we didn't find that many birds here and instead found our best birds at Pocono Environmental Education Center, about 150-200 miles away I believe. We went to marvelous weekend workshops that included room and board for about $100, though the food was cafeteria style and the lodging was bunk beds with thin mattresses. But we were too busy enjoying the birds and the trips with knowledgeable leaders to mind the spartan room and board. It was all that we needed to keep us going. The odd thing about this is that we got used to looking for Black-throated Green Warblers, among other birds, 100 feet above us in hemlock ravines. Needless to say we didn't get great views at that height. About five years later I ran across one or more Black-throated Greens at eye level less than a mile away along the Wissahickon. It was quite a revelation to find these seemingly rare birds, here at home and with great views. If I could summarize our birding since then I'd say that much of it has been about discovering just how many birds can be found within 5 miles of our house. This transformation began with warblers and other passerines but it eventually included raptors, shorebirds and water birds. With the recent cold winters in the Midwest we've gotten more and more unusual, or somewhat unusual waterbirds, right in our own backyard. Yesterday we saw our first ever Canvasback at the Manayunk Canal, in a very small spot of open water, along with an American Wigeon, two Gadwall and numerous Mallard and Canada Geese. 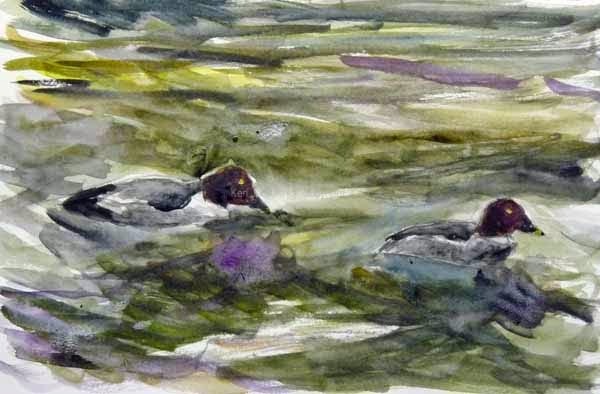 In my last post I mentioned the birds portrayed above, seen near Flat Rock Dam in the nearby Schuylkill River, two male Common Mergansers, a male Red-breasted Merganser and further back a male and female Bufflehead. We really do enjoy the birds we see when travelling, and we're lucky to have such a rich birding spot as Cape May, NJ nearby. But I think it's even more satisfying to be seeing all these birds of various types so close to home. It certainly makes for easier travelling. I expect the woodcut above to be in color, using a second woodblock for the colors. But there's a slim possibility I'll just leave it as a one color, one block woodcut. As usual this proof is on copier paper so it doesn't look like much. But for now it's just to give me an idea as to how to proceed. I'll get to better paper later. Red-breasted Merganser, Common Merganser and Bufflehead on Schuylkill River. Watercolor and Ballpoint Pen Sketch by Ken Januski. As the cold weather has piled up recently it's getting harder and harder to find any open, i.e. unfrozen, water nearby. Almost all of the Manayunk Canal has been frozen for a week or more. Even the large Schuylkill River has gotten to the point of very little open water, at least within a few miles of our house. On Saturday we went out briefly to find the area of the Schuylkill where I'd seen the Common Goldeneye recently completely frozen. But yesterday was supposed to get up into the 40s before heading back to 0 tonight. So I decided to explore the Manayunk Canal and the Schuylkill River that parallels it around Flat Rock Dam. Again almost everything above Flat Rock Dam was frozen. No Red-necked Grebes, as we found there last year, at least not until there is a real thaw. But in a tiny portion of open water right above Flat Rock Dam I saw a Common Merganser that looked different from the other two and didn't fly with them when I got within a couple of hundred yards. I figured it was a less cautious female than the two males that flew. But as I looked more closely I realized it was the first Red-breasted Merganser I'd ever seen. Earlier I'd walked along the Canal and along the Schuylkill south of the dam. Though I still haven't figured out how one area is frozen one day and open the next it at least wasn't any surprise that if there was going to be any open water it would be below Flat Rock Dam. And it was open. Far more than I would have guessed. But no birds were taking any advantage of it other than Mallards and one lone Common Merganser. Then I saw a small white object bobbing rapidly down the river. I assumed it was detritus and not a bird. But as soon as I looked with my binoculars I found a male Bufflehead. Soon I also saw the female. They flew upstream and downstream a couple of times as I viewed that area, hoping for some other birds. They were the first Buffleheads I'd seen this year. 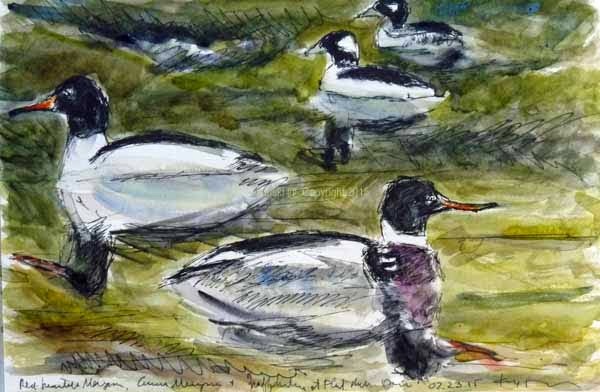 I took a few photos while out and finally decided to try to put a sketch together showing at least the Red-breasted Merganser and the Bufflehead. But I've come to an odd conclusion about grouping birds: two rarely work together and sometimes three don't. 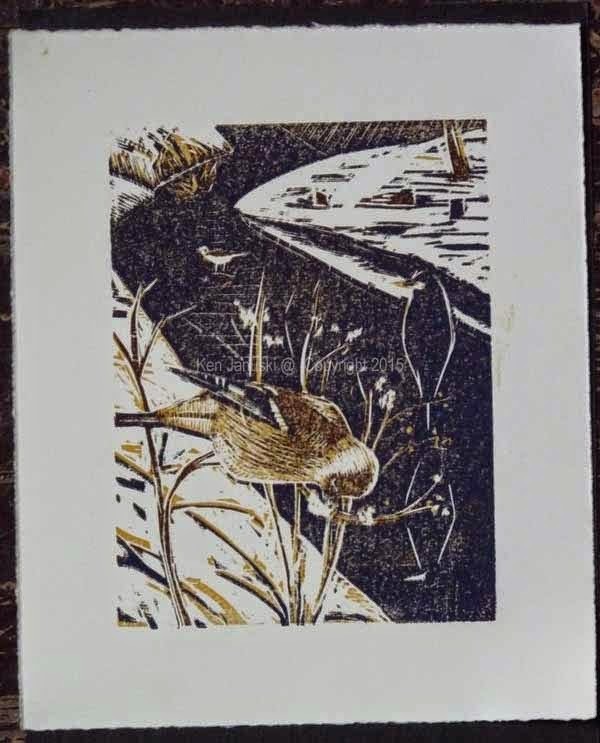 My recent woodblock of American Goldfinch, Great Blue Heron and Killdeer I think worked fine but I think that's because there were three different sized birds. Today the Bufflehead were the same size so the composition seemed more like just two birds. I guessed that this would never work. And so I added the Common Merganers. It's actually about the same size as the Red-breasted but I hoped that perhaps its different markings and slightly deeper placement might differentiate it from the Red-breasted. The Mergansers were in placid water above the dam whereas the Bufflehead were riding a fast and rough current. I tried to make the current a bit rougher in the back of the watercolor and pen sketch above but I'm not sure I succeeded. As with the GBBC sketches this is another quick one, meant more to illustrate something and test out a composition than anything else. Eventually though these type of sketches seem to turn into some of my best prints. Oddly enough on Saturday I'd been looking through the many photos of birds I've taken, tempted as usual at this time of year to do some warbler studies, looking forward I'm sure to warmer and brighter days to come. But something always bothers me about this. It's too much like doing studies or practicing scales. I'll probably get back to it soon but for now I'm happy to be working with something that I just saw. Common Goldeneye on Schuylkill River. Watercolor Sketch by Ken Januski. It seems I can't escape days with windchills of around zero for the Great Backyard Bird Count. Still here those cold temps do not come after many feet of snow as in areas north of us. The cold is a bit trying but our lives have not been made miserable. I'm sure there are a lot of people in the northeast who cannot say the same. I decided to try a brief walk along the Manayunk Canal and Schuylkill River this morning, testing out both the temps and the birds. Most of the Schuylkill has frozen since I was last there with just a few channels open. I didn't even bother with the much smaller Manayunk Canal. I hoped to see some waterbirds and soon enough I did. But what were they? I saw deep mahogany/burgundy/black head with what seemed like a long bill and very sloping head. I'm not as familiar with water birds as I am with some others. My first thought was Redhead due to the color of the head, then Canvasback due to the sloping forehead. But when I got home I realized that due to other characteristics they couldn't be either of these. It took me awhile to finally figure out that they were Common Goldeneye, a bird we saw about this same time in same location last year. Of course the golden eyes should have been a clue. I guess my brain was frozen. Other birds were fairly scarce though I ended the walk with a look at the Peregrine Falcon I'd seen a few days ago, back on the church steeple. As I drove home I checked the mileage -- about one half mile from the Peregrine to our house. Hard to believe! Since I'd survived the brief foray in the cold I decided to also visit Morris Arboretum, where we'd seen quite a few birds on Saturday. Due to the cold there were extremely few visitors there. I even feared that the arboretum might not be open. But it was and I had a pleasant walk. Towards the end I decided to see if I could find the Northern Mockingbird I'd briefly seen on last visit. Sure enough he was there fighting off four Eastern Bluebirds and two American Goldfinch. It is amazing how territorial they are, especially when food is scarce and it's as cold as it is. All of the work I've shown over the last four days has been completed in less than an hour. There are always many things that I have to ignore when I want to produce something so quickly. But as I said I enjoy it and learn from it. I think it's a good practice. Though some artists work too quickly probably more dally along forever, trying to think out a picture rather than paint it. No time for thought with these! Carolina Wren and House Sparrows On Feeder. Watercolor Sketch by Ken Januski. 'Playing It Safe' is one of those titles that works on many levels: 1) with a temperature of 7 and winds of 30 mph when I woke it up I thought I might not get out birding today and might need to play it safe by sketching something I could see from the house; 2) I could also play it safe by staying in and not freezing to death on a day where a falling tree might be more likely than an unusual, or maybe even usual bird; and 3, the original reason for the title, the smaller Carolina Wren in this picture has learned to play it safe by actually getting into the feeder thus frustrating the efforts of the larger birds, like the House Sparrows pictured here, to bully him or her out of the way. Quite a few years ago, when I did a lot more woodworking than I do today, almost all of it with handtools not power tools, I bought a multi-plane. I can't recall whether it was a Record or a Stanley. It was a beautiful plane with far more capabilities than a rank amateur like myself could ever use. Once I got it though I wanted to try out some of its cutters, specifically the ones for molding. I did so on a piece of pine I think though perhaps it was a harder wood. In any case I ended up with a nice fairly complicated piece of molding with no conceivable use. And then I thought I could make a little 3"x3" bird feeder. That was 10-15 years ago and yet it remains one of the favorite feeders of backyard birds. I did coat it with varnish as I recall. Otherwise it could not have survived. Carolina Wrens are often the first birds at our feeders in the morning and they often get the peanut pieces in the feeder all to themselves. But soon enough the hordes of bullying House Sparrows are there and drive them off. Finally at least one of the wrens got wise. It now sits itself down in the feeder where it is somewhat immovable. Finally enough belligerent House Sparrows may chase it off but it is able to eat a bit longer. 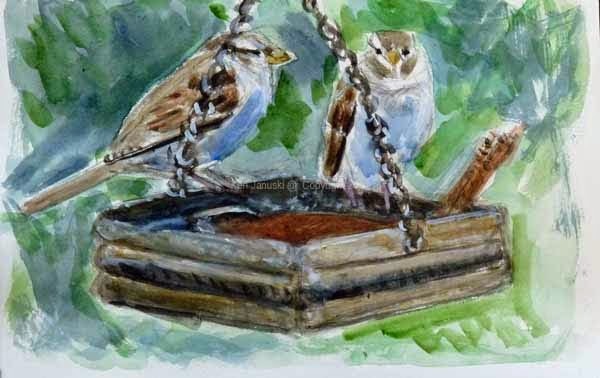 This pencil, watercolor and gouache sketch is done from memory and from photos I've taken of House Sparrows and Carolina Wrens and also field sketches I've done of them. 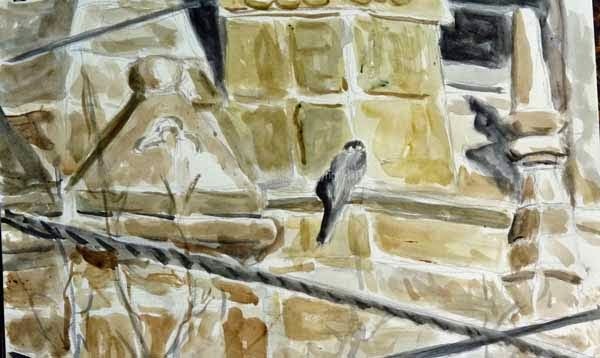 I had to use white gouache because I realized I'd made the wren too large in relation to the House Sparrows. In fixing that I lost the white of the supercilium and throat. So out came the white gouache in the hopes of regaining it in its new smaller location. Once I add gouache I know that I'm on to a rougher type of watercolor. I'm no longer playing it safe. At this time only brute force, mainly of gouache and opaque colors have some chance of saving the day. Such sketches almost always end up looking rough. But they also are among the sketches most likely to serve as the basis of a later painting or print. If an unusual bird appears in the yard or I decide to brave the cold and windy weather later today I might post a bonus GBBC picture but most likely I'll play it safe and stick with this. Another day, another deadline. One problem I've found with trying to 'illustrate' in some way or another each day's experience during the four days of The Great Backyard Bird Count is that I start getting anxious as the day's birding draws to an end and I don't have any idea what I'm going to do. The easy answer of course is to just do nothing. But this is a personal challenge of a sort so I always try to do something. We birded the backyard, Andorra Natural Area and Morris Arboretum from 7 a.m. until 12:45 p.m. today. We didn't see anything quite as exciting as the Peregrine Falcon from yesterday but there were locally good birds like Golden Crowned Kinglets, Brown Creepers and Winter Wrens. I don't really like to take photos so I hold off as long as possible, unless I'm trying to get evidence of an unusual bird. I never have enough good photos, or good looks at Winter Wrens or Brown Creepers so I was a bit tempted to take out the camera for them. Still I held off. I finally did take it out toward the end of the day as the one Brown Creeper crept higher into the gray overcast sky. By that time it would have been pointless to take a photo. Getting desperate I did take a couple photos of a Great Blue Heron feeding quite studiously in Papermill Run at Morris Arboretum. This was just a backup in case I got desperate. It was too cold to consider sketching, even though I did have the sketchbook, so I took those photos just in case. Later as we moved over toward the Wissahickon a large bird flew up and drifted toward the other Great Blue in Papermill Run. Yes it was another Great Blue. I have quite a lot of horrible sketches of Great Blues in flight. They are always striking but I never get them right. So this time I just took two quick photos. With the overcast sky they don't show much. But both give a good sense of the bird, the curve of the back, bend in the neck, length of the wings and especially the legs with feet pointing up rather than down. 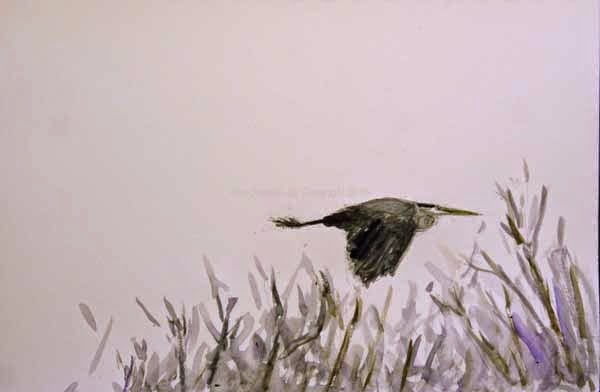 That became the subject for today's illustration: a Great Blue Heron gracefully drifting out of view. You never know what will happen when you challenge yourself like this. But often I find that I try something new and that eventually I end up using it somewhere. Peregrine Falcon on St. John's Church Steeple. Watercolor Sketch by Ken Januski. Today began the Great Backyard Bird Count. I think today and the upcoming weekend may be the coldest in recent memory for it, though certainly not the snowiest. I was a bit reluctant to head out with a windchill of 0 or so. 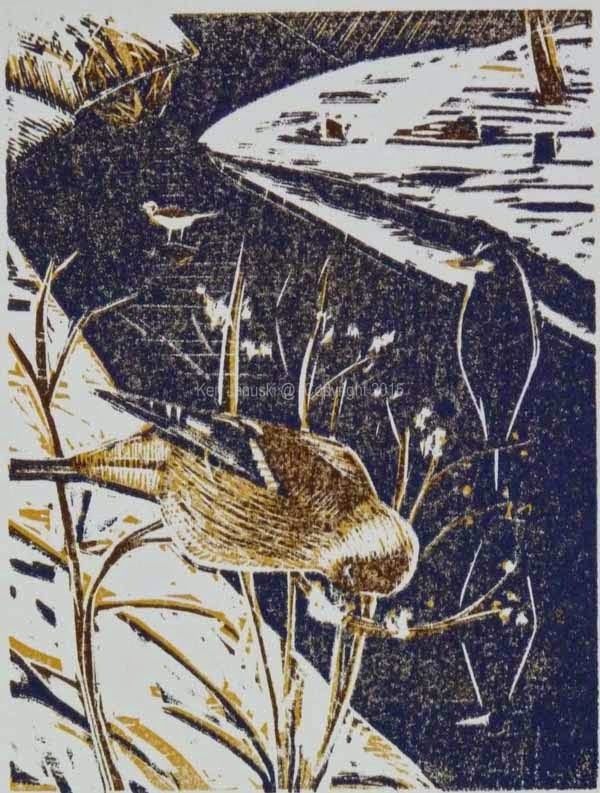 This was especially so as I'd seen no birds in flight from my studio window earlier in the morning. Generally at least the European Starlings and Mourning Doves are active by 7:45 a.m. I'd also had reports that one or two of the nesting pair of Peregrine Falcons had returned to St. John's Church down the hill in Manayunk. On a warmer day I would have swung by the church. But today I decided to stick to the Canal as it paralleled the Schuylkill River, hoping to see water birds. They at least should be out. I did see a number of Mallards and a couple of female Common Mergansers. I didn't see much else though nearer to Main St. I did see an American Robin and a European Starling squabbling over berries. As I looked up I also saw the church a few blocks away. Might as well scan it I thought. I did see a bird but assumed it was more likely a Rock Pigeon than a Peregrine. From that distance I couldn't tell for sure. But I took one photo just in case. When I got home I found a handsome Peregrine on the steeple. Above is a pencil sketch with watercolor based on the photo. I've never been an illustrator. So I've never had to work on deadline with representational art. However I do like the challenge of illustrating these GBBC forays. I always have limited time and I like to try to illustrate each day's sightings, sometimes with more realism than other times. If I work from photos, as I did today, then it looks even more like an illustration. This was done in one hour in a Stillman and Birn sketchbook. My guess is that it will be by far the most realistic sketch I do during the GBBC. 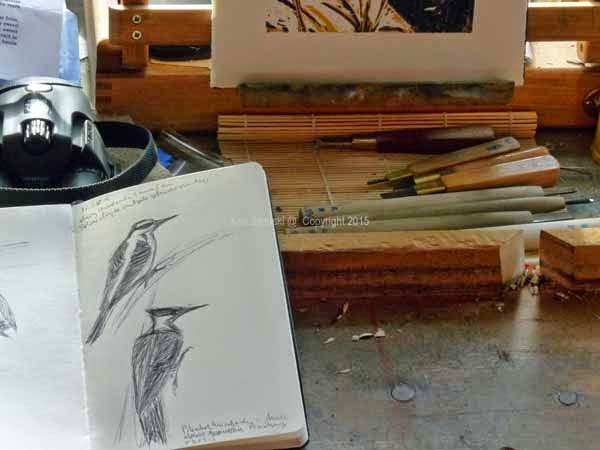 Moleskine Sketchbook with Woodpecker Field Sketches and Carving Tools in Studio. Photo by Ken Januski. As I was winding up the reduction woodcut I've been working on I kept noticing my poor neglected sketchbook off to the left of my cutting area. Though I take it out with me when I'm out birding I just can't convince myself to take it out and sketch in winter. The top sketch in photo above of a Hairy Woodpecker, conveniently outside my warm studio window is from December 28th. The page to the left has an Osprey from late November. Today was particularly cold due to the wind so even though we watched a handsome male Pileated Woodpecker for at least 15 minutes I didn't sketch. But when I got home the guilt was just too strong. I HAD to resume sketching. So the photo at the bottom is the male Pileated from memory. It's not much but at least I'm reviving the habit. Back when I was reading a lot about Winslow Homer, one of my favorite watercolorists, I read how he worked in his studio in Maine during the winter on his oil paintings. Everything in its place more or less with watercolors in the field in warmer weather and oils in the studio in winter. So it's really not surprising that I should do more prints in winter, and more sketches from photos. But still it's nice to work from life, or at least from memories from life. American Goldfinch, Great Blue Heron and Killdeer Along Snowy Banks of Manayunk Canal. Final Edition of Reduction Woodcut by Ken Januski. Another reason I felt like sketching, and birding, is that I've finally finished the reduction woodcut! And I'm happy with it. The final version is above. I'm still not sure how many of the prints will go into the edition. I started off with 16 but there are a lot more prints will small smudges than I'd like. So I still have to figure out which ones will be in the edition. The more the better though, because I really like this print! Opera!?! I'm sure the connection between opera and representational art will seem very hard to believe to most readers. Though my knowledge of, and even experience of opera, is very small I have spent some time listening to and reading about it over the last six months. Unfortunately I've seen and heard none in person. One of the books I've been reading is The History of Opera by Carolyn Abbate and Roger Parker. In many ways it's ridiculous for me to be reading this because it's aimed at people familiar with opera, which I am not. Still it does complement the Listening to and Understanding Opera course by Robert Greenberg from The Teaching Company that I've been listening to for about six months. One of the main themes is the constant pendulum swing in opera between freedom for the music, especially the singers and strict adherence to the text, to the story being told. I got a kick out of reading about this conflict because it's the one I experience in art ever since I turned from abstract art to representational art, specifically wildlife art, and even more specifically bird art. As I've said many times I'm quite bothered by the seemingly blind adherence to photographic 'fact' that seems to dominate so much bird and wildlife art. Where in the world is the art? Where is the artistic expression? I found this surprisingly parallel to what I read about opera. The only difference is that it seems that more often it is the strict literalists calling for reform, asking and demanding that the music be truthful to the story, not an afterthought. Often melody and song have been the leading factors in opera. The story trails behind. And then the pendulum swings back the other way. It seems to be a steady conflict. The only difference that I can see in my comparison with representational art, especially wildlife art is that the pendulum has rarely swung in the more expressive direction. In my own work I cannot deny my familiarity with art, art history and all the great and powerful art that has been made over thousands of years. It's impossible to deny the expressive possibilities of art. At the same time I do want to keep some attachment to the story, or in bird or wildlife art, those so-called 'facts' of description. The debate as to how true I should stay to the colors of the scene along the Manayunk Canal has been a big factor in deciding which colors to use in my current woodcut. Color is just as emotionally powerful as song and I think it's foolish to deny it. So I've finally decided on a dark purplish blue for the third color of the woodcut. I spent a lot of time proofing and thinking and finally came up with this color. The final color will probably be black, both for the goldfinch's wings and for the water. But the dark purple blue almost functions as a black so instead I might let it function as black and just use a lighter gray blue for the Great Blue Heron and some other areas. It will continue to be a debate between song and story, or wildlife 'fact' and color and art. Below is a photo of the full image of the print. Because the ink is taking longer to dry than I expected the print itself is taking longer than expected. American Goldfinch, Great Blue Heron and Killdeer at Manayunk Canal. Third Color in Probable Four Color Reduction Woodcut by Ken Januski.